12" DS3011 planetary polisher has been improved to include built-in dust collection port and a more powerful motor. The DS 3011 Planetary Polisher is a rugged, planetary powered tool designed to produce a flat, swirl free finish on counter tops, floors, walls and steps. It has become the industry standard. The unit will grind, hone, polish or clean concrete, terrazzo, marble or granite surfaces using coated abrasives, diamond polishing systems, light weight diamond wheels or brushes. 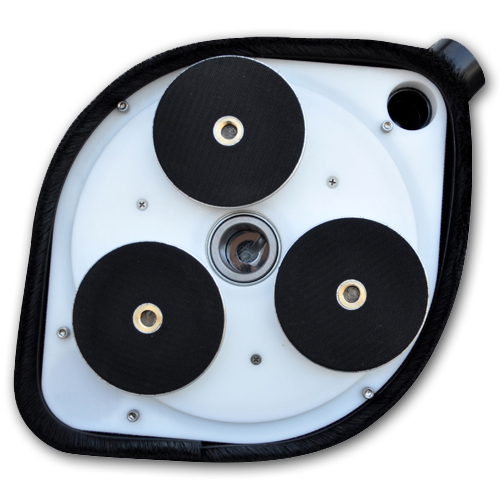 The system operates wet or dry using the built-in vacuum port. A metric (230 v with M14 thread) version is available (DS3011M) for Europe, Australia and Asia markets. Please contact us for details including pricing and delivery. This is a true planetary gear driven tool. The 12 platform turns at a lower rate than the higher rotational speed of the 5 platens. This combination of rpm provides an optimal speed and direction for diamond polishing, producing a perfect finish up to 10 times faster than a single head polisher. 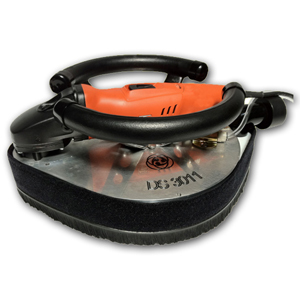 The unit is powered by a heavy duty FEIN polisher. A center coolant feed, precision, triple sealed bearings and sturdy construction make this the ultimate tool for perfect flatness and a superior polish. For more details of this tool, please click this link for DS 3011 12" Planetary Polisher.